Jessica and I were both curious and scared, so we grabbed each other and peered inside. The handle jiggled forcefully again and we scurried away. Of all the things I’d seen thus far, that silly door handle frightened me the most. I can’t say why. I don’t want to anthropomorphize a door handle, but it seemed angry. Back in the house we related this new event to Diana and Ashley and we decided to go outside and debunk this enigma. I was scared, but with the four of us, I knew that I could do it! First, we went inside the barn and examined the door. It was perfectly still. A large garage door banged, so I went outside to look at what could cause that. Pushing on it with moderate force made it swing and loudly bang. That was explained away, but not the door inside. We all went outside to see if there were a window we could look through. It was dark and we could make nothing out. That room was completely inside the barn with no outside access, so we were doubtful that a draft would be the reason. No explanation could be found. We went back upstairs to the Children’s Room because it seemed to be the most active place in the house. We all sat on the beds as we watched the door. It remained still until we began asking questions. It responded very well to Diana. She would ask yes/no questions and we interpreted it as a yes when the door opened and a no when it shut. This happened so many times that I have to believe it was something intelligent. As this was going on, I felt a tremendous depression. It was almost a crushing sadness, I’ve rarely felt like that in my entire life, and I never want to again. It was a consuming melancholy and I just wanted to cry. I don’t cry. This was a strange reaction. When I said how I felt, I was relieved and intrigued when Jessica, Ashley, and Diana all felt the same way. We continued our questioning for a while. Each time the door opened a few inches I felt elated and then when it shut again, an overwhelming sadness and nervousness. We decided to play with one of the many balls in the room. It is frequently reported that something will roll it back to you if you play. We hadn’t had any success with this earlier, so now we decided to try again. The ball didn’t roll back, but it did roll oddly. 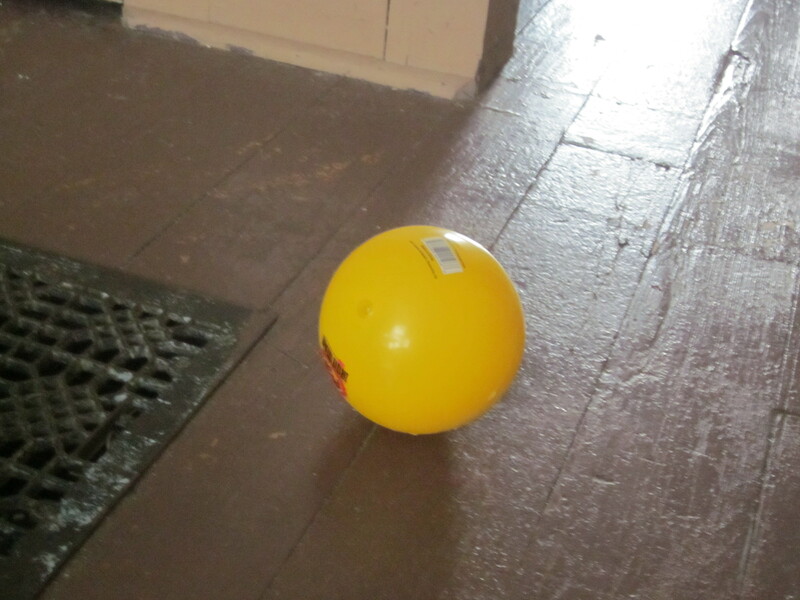 The floorboards were sagging, but the way the ball moved didn’t really make sense with the angle of the floor. I’m not sure what that was about. After a while we couldn’t find one of the three balls we were using. It’s a small room and none of us had moved so it made no sense. We found it beneath the bed, which really wasn’t possible. A heavy, woven blanket was draped over the bed that reached onto the floor. There was no gap for the ball to roll under, and yet it was there. We opened the door to invite the entity or whatever it was to join us. After doing that, I felt frozen. It was a very hot night, in the nineties and the air conditioner was struggling to keep the temperatures livable. There was no draft from the air conditioner in the room, but I felt as if there were a cold breeze around my bare legs. It was the most curious sensation. I decided to move about the room and when I reached a new position, the air around my legs felt warm, but not long after the icy breeze returned. This happened multiple times and made me so sad. After a while the chill dissipated and the room felt absolutely still. It was as if whatever we were experiencing had left. We all agreed that nothing more was happening, so we shut the closet door and left the room for a break by the barn. Sitting out in the balmy evening, we discussed our feelings and thoughts. Not one of us had felt a negative energy. We hadn’t felt foreboding or a sense of evil. We just felt sad. Tragic would be a more appropriate word, the whole place felt tragic. We decided to return to the room one more time to see if these events would repeat. Diana and I went up first and the door was still firmly shut, but as we came inside, it opened right up. I couldn’t help but smile, it was so strange and unusual. My videos are terrible and I’m upset about that, but this video on YouTube shows exactly what we saw. It’s breathtaking in person. The room didn’t feel nearly so sad this time, so we decided to ask it a few more questions. The chill came back to me and I think this must be a cold spot. I’d never experienced one before. Diana asked the door if it was playing with me and it immediately opened. Curiosity overcame me. I don’t know what I thought I’d find, but I decided to open the door. As I did, you could almost feel the tension in the room break. It was still again and warm and whatever had been in there with us was gone. It was just an empty room. We decided to settle in for the night, so while everybody was preparing for bed, I sat in the kitchen and worked on my notes. I felt totally at ease sitting alone at the kitchen, not a care in the world. I came to the conclusion that I didn’t know what to conclude about the Ax Murder House. Was it a residual haunting or an intelligent haunting? Was it haunted at all? I doubt anybody can know for sure and with that I went to bed. We had made piles of blankets in the parlor and were all ready to catch a few hours sleep before packing up and heading home. I couldn’t sleep at all. I became anxious and nervous. Then something exceptionally creepy happened to me, I didn’t share it with anybody because it unsettled me. In my head, I distinctly heard a voice say, “Suffer the little children.” I didn’t know what to make of this, but my mind immediately recalled what the Reverend George Kelly had said about hearing voices. I’ve never heard voices before in my life. It was most peculiar and decidedly terrifying. My heart raced a bit and I tried to sleep. It wasn’t happening. In the perfect silence, I thought that I could hear footsteps from upstairs, but nobody else mentioned it and I didn’t want to wake them if they were sleeping. But then, from upstairs a tremendous bang could be heard. It had the distinct sound of the closet. We all sat bolt upright and looked at each other and started talking. Then, in a moment that felt cinematic, bells started going off from the upstairs. There were a number of bells attached to a rocking chair by the stairs. We all hurried up to the second level and looked at everything, but not a thing had changed. Although the closet had certainly slammed shut, it was still wide open the way we had left it earlier. We sat up a camera so that it could capture what might happen. It was incredibly exciting. Jessica and I braved the barn one more time to get ready for bed. As we were leaving the barn, Diana and Ashley came running out of the house, squealing with fright. They had gone back down to the parlor and through the grate could see the light from the videocamera. Suddenly it shut off, which should not have happened, a button had to be physically pushed to turn it off. Together, we went back upstairs and turned the camera back on. Settling back into bed, we looked up through the grate and suddenly the light turned off again. We all gasped and sent Ashley up to investigate. One of the people we were with was sleeping in the parent’s room and was shuffling about, but didn’t turn it off, it shut off when he went into the room. We couldn’t explain it away. A six o’clock, we all finally fell asleep. Two hours later we were up. A rose was discovered on the stairs. Nobody had been up or down those steps since we went to bed. There was a dried rose in every room. How it ended up on the stairs, we can’t say. At nine, we were packed and ready to go, so we said a brief blessing and headed out for breakfast and home. 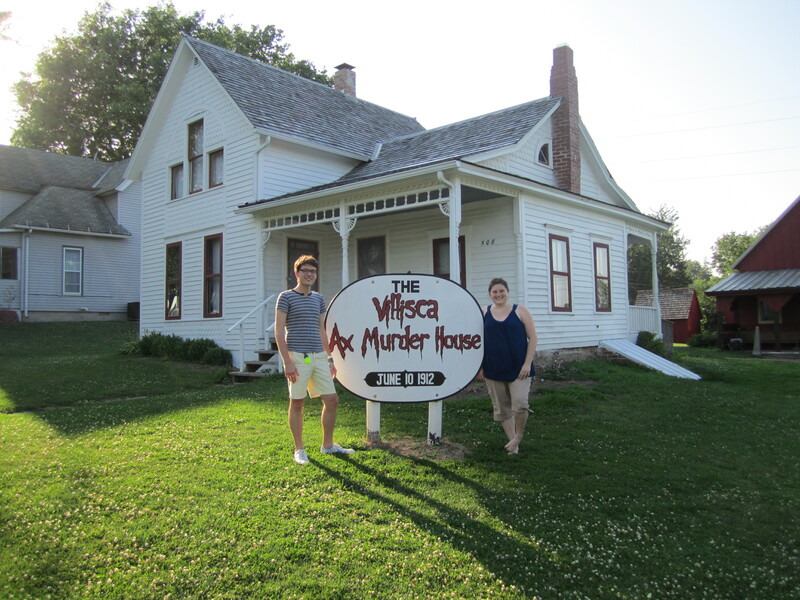 Thinking back on it, I’m convinced that the Villisca house is haunted. In my opinion, the spirits of the children remain. I have no proof of this, but that’s the sensation I felt. Everything felt innocent. I didn’t feel an adult presence and I didn’t feel anything evil. I have no reason to believe that the ax murderer(s) is/are still lingering. That theory doesn’t make sense any way. Why would he/they return to the place of the crime upon his/their death? It makes more sense for it to be the children. They were supposedly murdered in their sleep and had no reason to know what happened to them. Perhaps they are still there, confused why they have been left alone, looking for help? I do believe it is an active haunting. But I also believe that there is a residual energy. The sensations of dread and sadness and occasional fright seem to be residual. Is it the most terrifying place in America? I don’t think so. I didn’t think it was terrifying. I would be happy to go back and do more investigation and I’m sure that everybody who went would agree. I’m still working on the EVPs from our time and there are several very interesting things so far. When I get them all finished (we recorded hours of them) I’ll post an evidence blog.